I couldn't believe this would happen so fast. Before I could post some other photos within the week, the damage on these shophouses has begin. 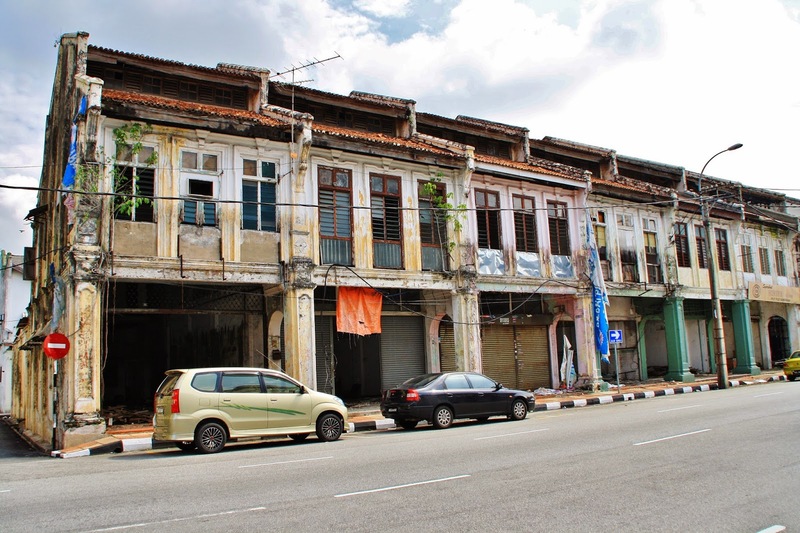 As I have just mentioned in my last post on 30 November, there are not many block of pre-war shophouse in Ipoh downtown could remain entirely untouched. 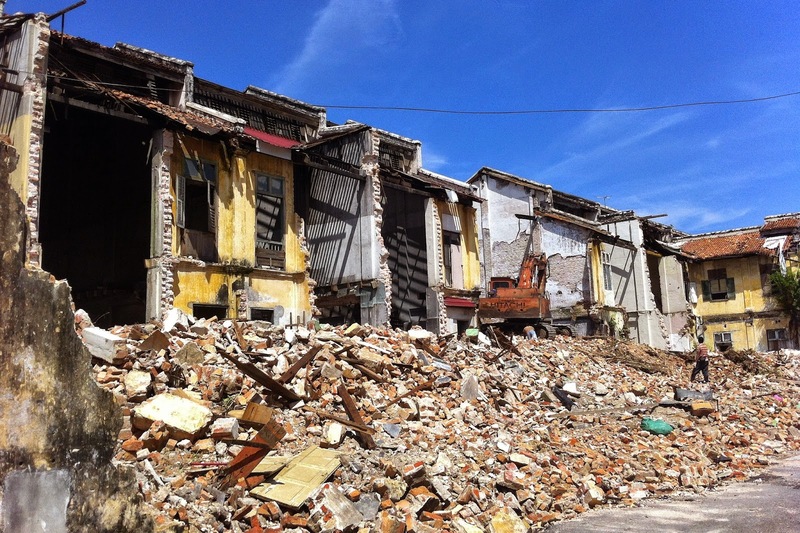 However, the current owner just do not appreciate the architecture of pre-war buildings, or having no interest to restore the old buildings and choose to tear them down. 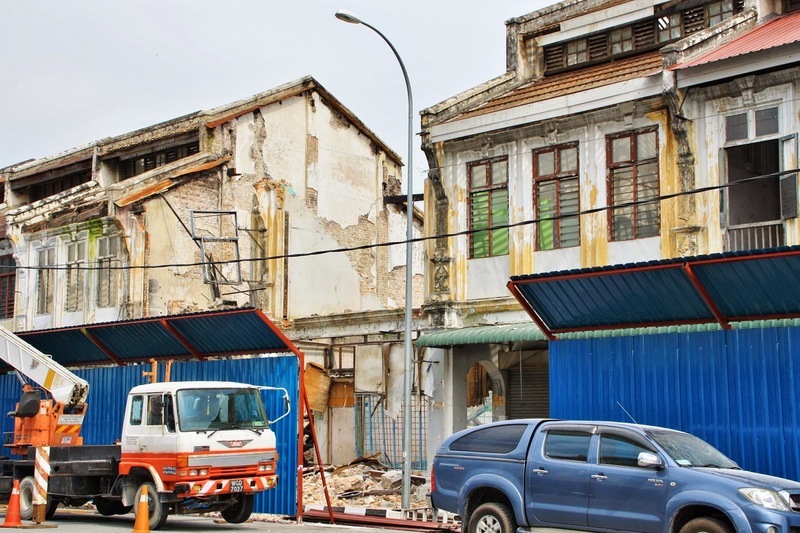 This is exactly the same "tragedy" which had happened to the shophouses which stood at Chung On Siew Street, current Ibis Style Hotel location, and the block of shops at Hume Street. 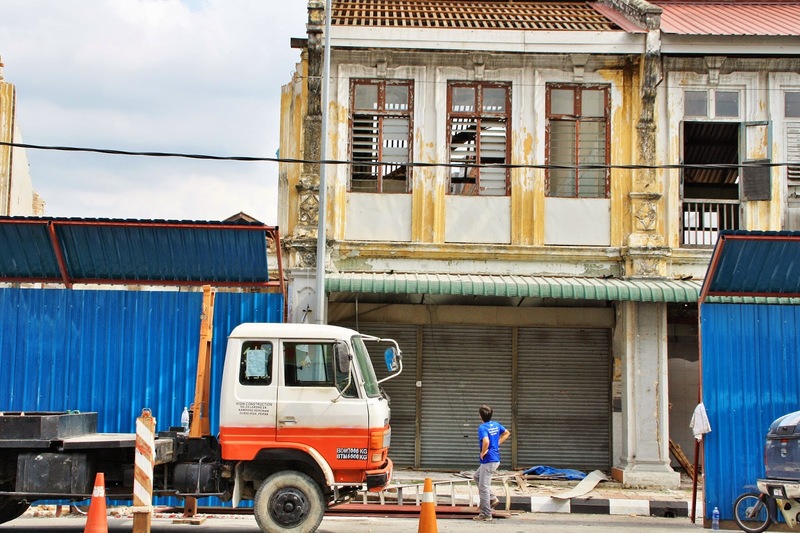 If the wealthy corporates or business men continue to put aside the value of heritage building and destroying this evident that witnessed the city's growth, it will be meaningless when we tell our future generations & visitors about the history of Ipoh. Many would think that heritage preservation is just to maintain some of the well-known buildings. This is simply an excuse which equivalent to letting a tree remain while the entire forest is being wiped off. Mid-year is always a dry season in west coast of Peninsula﻿r Malaysia. 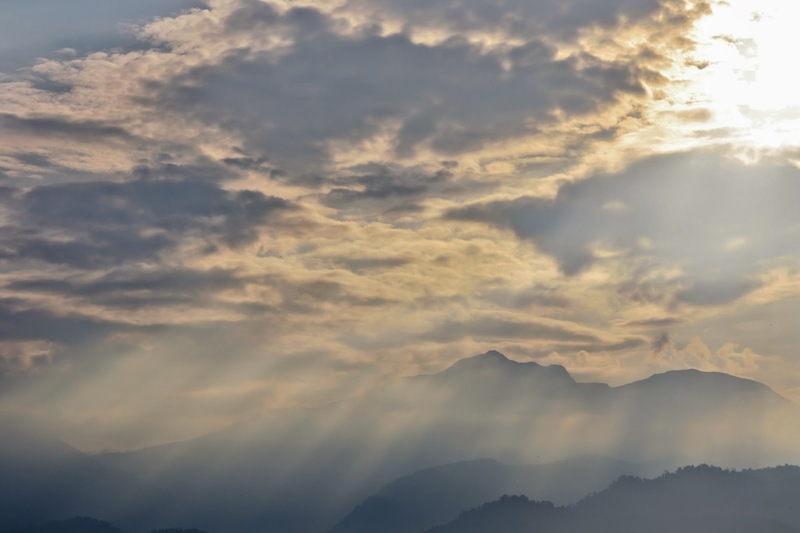 A few weeks without rain would instantly bring haze to cover the atmosphere of Kinta Valley. In this view from Ipoh Parade car park, the mountain range is fading from sight and buildings at distance are seen to be blur. This has become very common in the recent decade, most probably due to increasing activities of open burning and tremendous growth of motor vehicles. 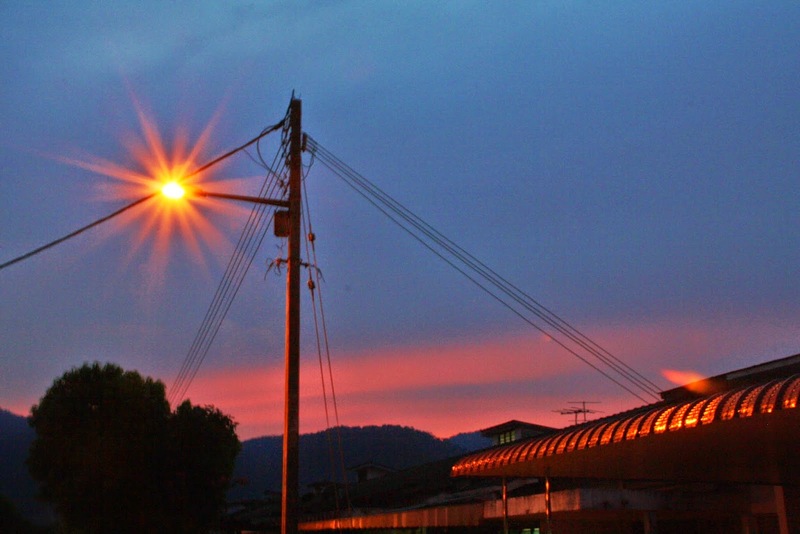 Ipoh had been a well known boring city with was seriously lacking of taste of art. However, situation changed when the younger generation in this city begin to deliver their creative and artistic products to the public. And many realize the city with its attractive history and beautiful heritage is a great place to grow its unique local cultural art. As simple as this printed artwork on a renovating old shophouse, though not a masterpiece of art, able to enhance liveliness of Ipoh. Getting more people to know a product or service is the ultimate aim of an advertisement. 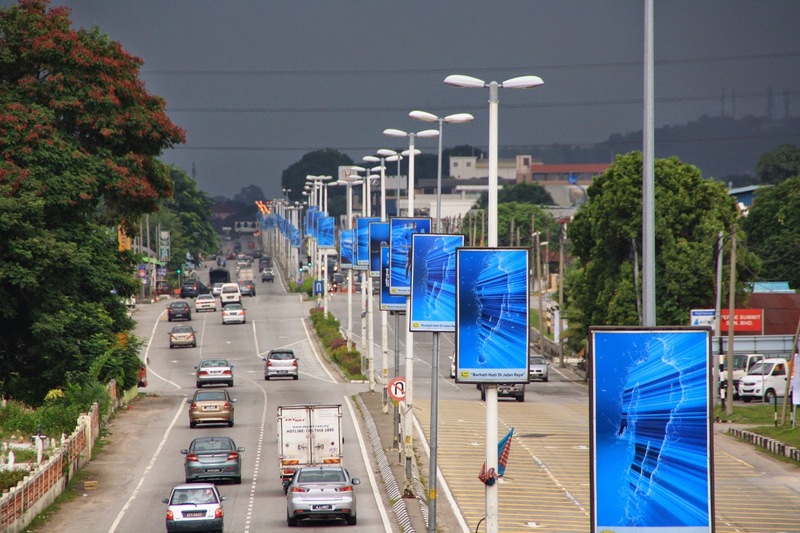 Still billboard on the street has evolved from painted or printed poster, to changeable images, and later to LED display which became popular in the recent years. It is now appear in Ipoh a truck with LED displays acting as a mobile billboard in order to maximize the effectiveness to spread product information at widest possible coverage. One day we may see the conventional advertisement at the exterior of public transport replaced by electronic screens. Cititel Express is putting up a giant banner to commit its opening by end of year 2014. The construction has reached its top floor but yet there are plenty of detail works to be done before it can open to public. It seems the hotel really need to gear up to an express mode in order to hit this aggressive target. 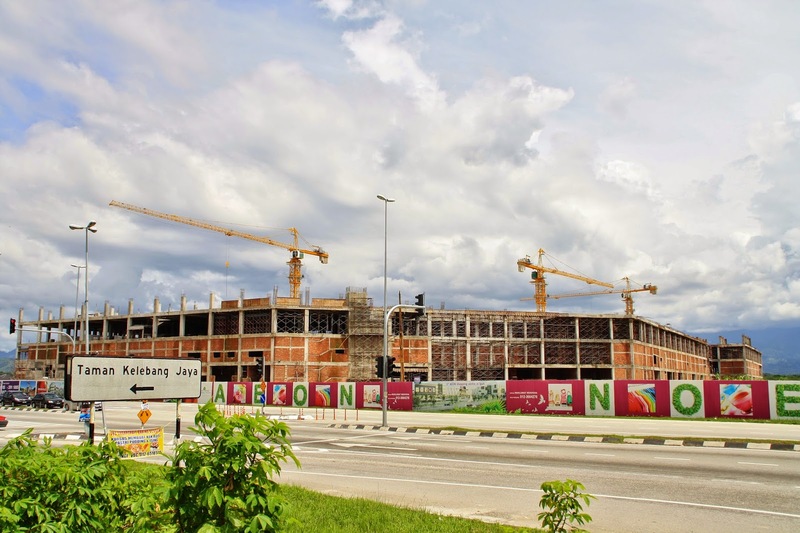 Comparatively, the progress of Cititel Express construction is certainly ahead of another major hotel project in town, Weil Hotel, which kicked off earlier than Cititel but no sign of completion in near future. The renovation of Ipoh Parade has come to an end where the brand new look of its exterior is now fixed with the new logo as well, which is more dynamic and energetic. Despite upgrading of the mall, its tenants, indeed do not change much where majority of the existing occupants remain while not many new brands turn up. Nevertheless, Ipoh Parade still successfully attracted bigger crowd as compare to its performance several years ago. 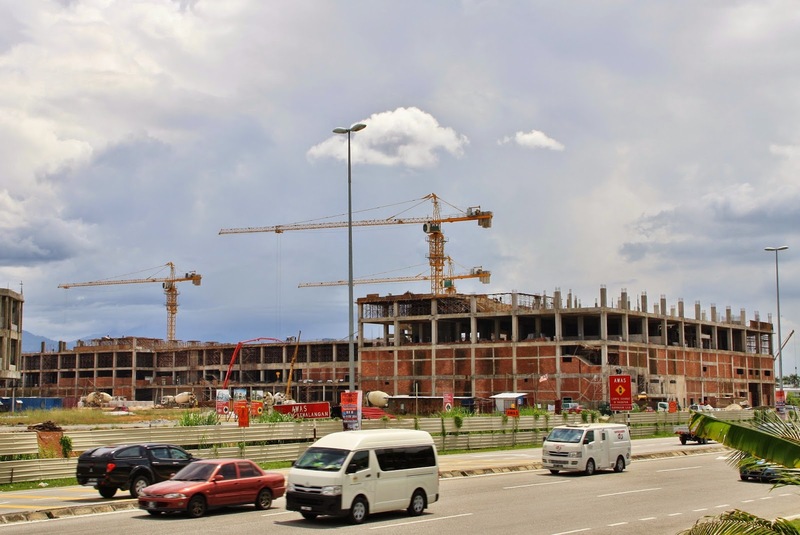 We just hope there will be more choices coming into the mall to make it shopping in Ipoh Parade a delightful experience. The Syuen Hotel that I familiar with for the past twenty years is always a bulky and bloated building. However, today when I walk by from the west towards the sharpest angle of Syuen Hotel, the new signage draws me to look upwards. Suddenly I find the scene is kind of familiar which later reminds me of a famous building, the Flatiron Building of New York City. Of course this is only an illusionary angle of view. The scene would completely change at just few steps away. 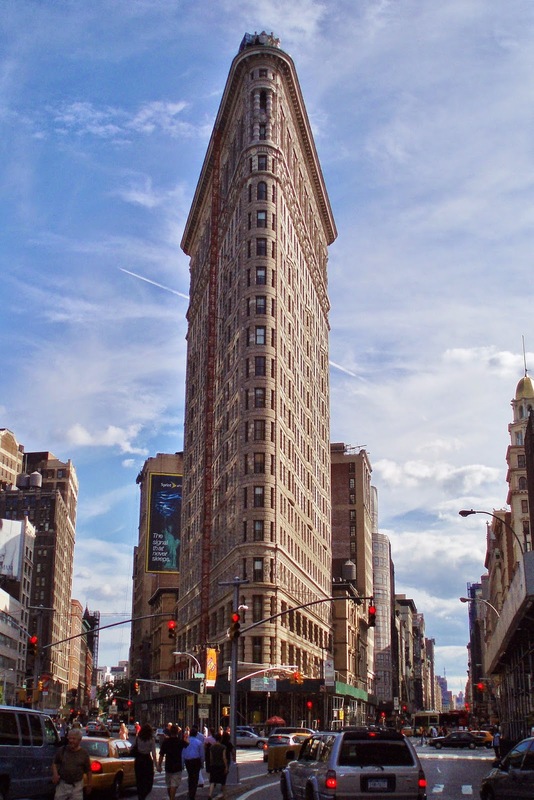 While back at home, I started to retrieve the archived folders of photos and get the below image of Flatiron Building which I took in 2007 during my last trip to United States. Since the last post about Excelsior Hotel in April, which found its notice of closure for renovation, the intensive work is expending from interior to exterior. Bricks and cement walls are torn down and piled up like rocks at ground floor. Old windows removed and replaced with new frame. Painting work is aggressively carried out even under the burning hot sun. Anyway I find the new exterior colour is going too dark. If the entire hotel building painted into this colour, it will appear as a giant grey block in the city. Well, it's hard to judge at this stage. The end result can be marvellous. Night scene of Old Town does not differ much from New Town, except there is lesser high rise building, despite one hotel project is on going. 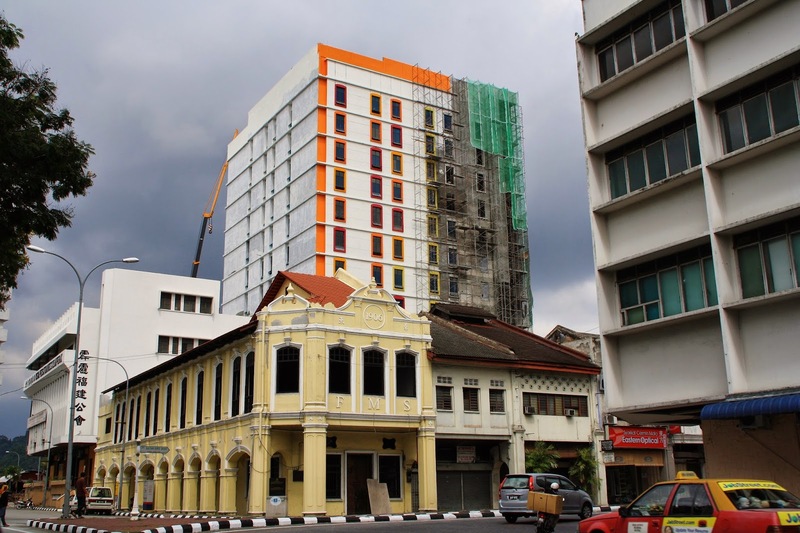 Old Town shall be controlled to limit number of high rise building in order to maintain the originality of the oldest part of Ipoh. We shall learn from the European cities, where most are still maintaining their heritage buildings properly without excessive interference of modern architecture structures. 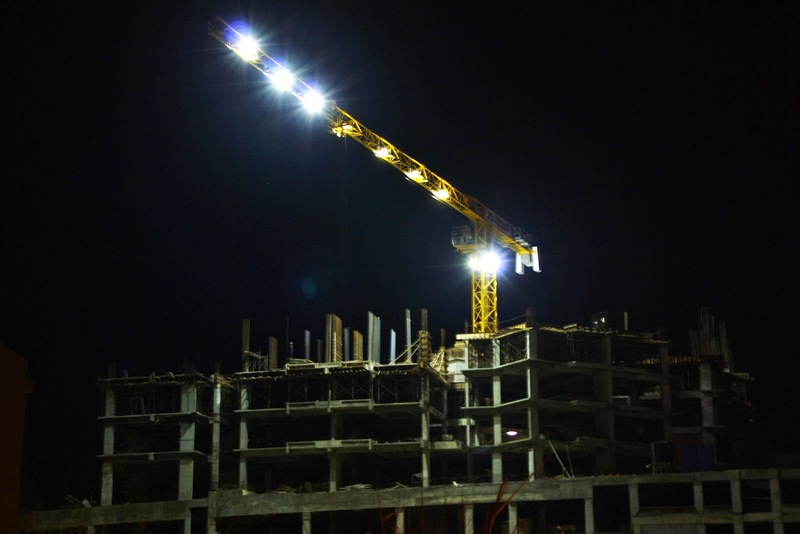 Night scene of New Town skyline is seen with additional lightings, mainly from the working tower cranes at several construction sites. Although Ipoh city skyline at night is still lacking behind as compare other Malaysian cities, it has slightly improved from the past with some new decorative signboards on the high rise buildings. Hopefully there will be more creative lightings upon completion of few major projects (Weil Hotel, The Majestic, The Octagon, Ipoh Convention Centre) to beautify the skyline at night. A extraordinary bright moon is seen tonight which caught my eyes when I was on the way home. As I know today is the 16th day of lunar month, and full moon last night should normally the brightest one. Anyway, I get to know later this is indeed the super moon. It appeared bigger when it was just rose from the horizon. Unfortunately I was too late to find a nice spot for capturing the super moon. Luckily there is a second chance very soon, where we shall expect another super moon on 10th August 2014, and I wish there will be clear weather to witness the beautiful scene. When Will The Station Hotel Return? 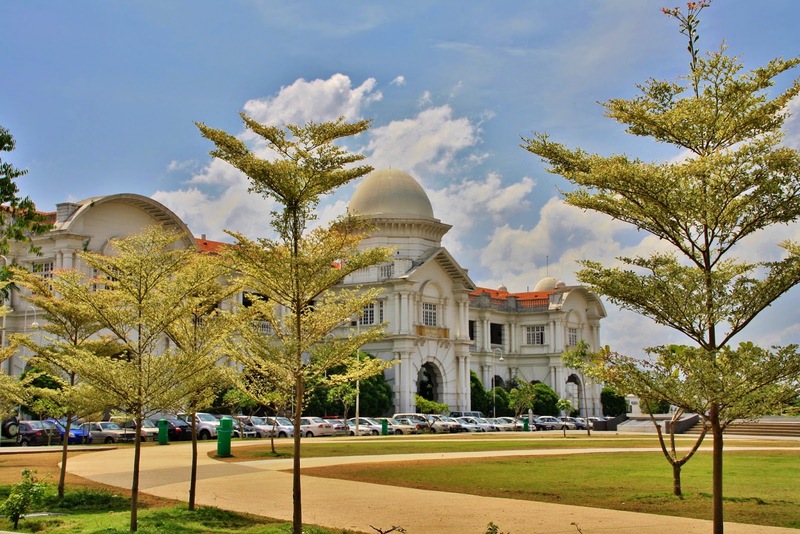 Despite newer and greater buildings appear in the city, Ipoh Railway Station, though reaching its age of 97 years, still stood as the most unique landmark of Ipoh. The recent change of landscape at its front garden gives a better full view of the Moorish style station building. It is regret that the nostalgic station hotel still not finding any new owner and currently leaving vacant to deteriorate. 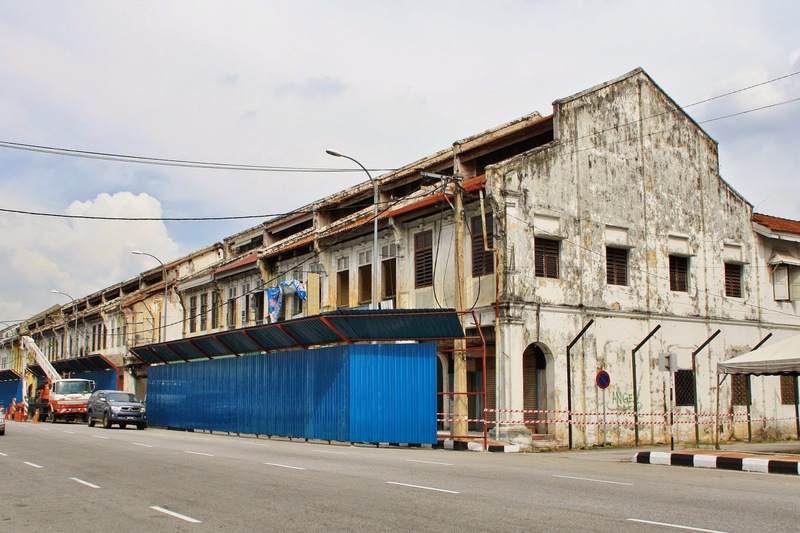 Despite many investors constructing their new hotels in Ipoh, wonder why none of them have interest to re-develop the station hotel. 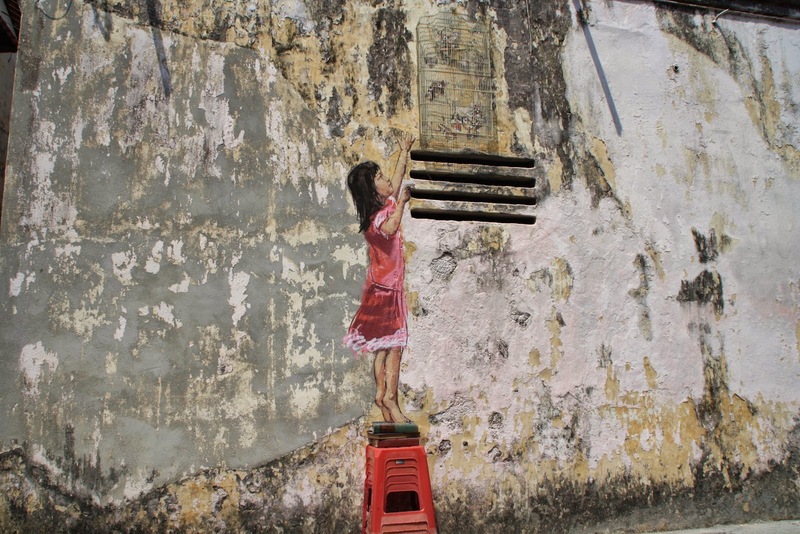 The seventh mural by Ernest in Ipoh, is rather different from his ordinary style. The piece of art on the wall carries characteristic of Chinese ink wash painting that illustrates scene of tin mining, which built this city up, and Ipoh's famous lime stone hill. Coincidentally, this mural is also painting on the originated site of a well known local-born healthcare and pharmaceutical brand, Hovid or better known by the locals as Ho Yan Hor. With the completion of this mural, Ernest has accomplished his plan in Ipoh and we would thank him very much for bringing Ipoh such fantastic paintings. Besides attracting tourists, we hope it would also light up the spirit of art in Ipoh to grow it into a culturally brilliant city. It's a peaceful evening of Saturday in First Garden. Despite tortured by the extensive heat in this warm day, the moment of sunset is always beautiful and charming with the red, orange, purple and blue joining to paint the sky. While the darkness gradually covering the atmosphere, street light starts to take over in the twilight to guide us in the dark.